Hello again! It’s Nanda, the Pahadi girl. After completing the majestic trek to Kedarkantha and Har ki Doon last month, I got another opportunity to explore the unbound Himalayas. 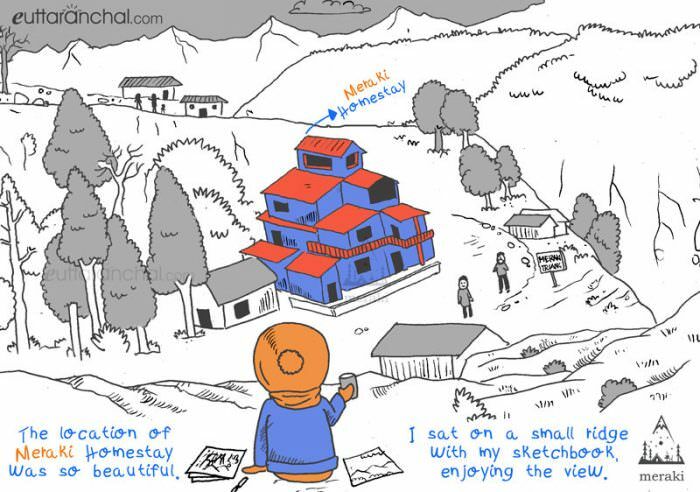 This time, I was invited to Meraki Triangle homestay at Dugalbitta (Chopta). 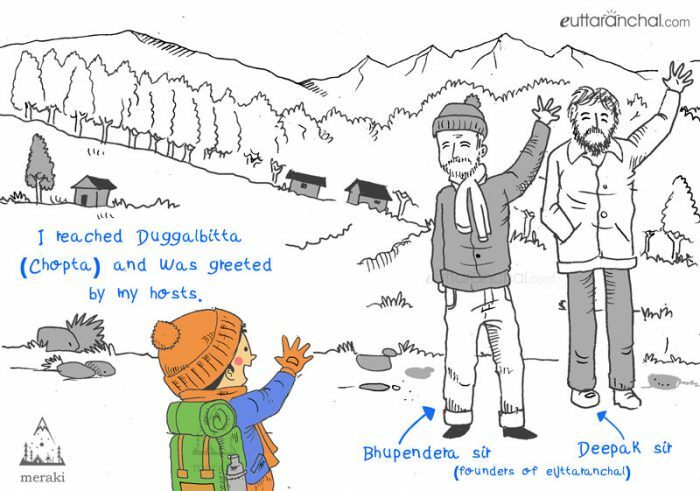 Even since the Kedarkantha trek, there has been an insatiable urge to travel. Wanderlust is difficult to quell, I guess. 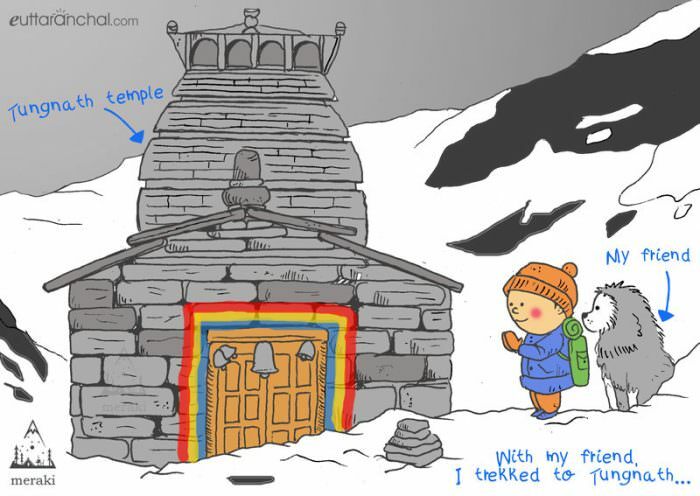 I have never been to Chopta, and always wanted to visit Tungnath, the Shiva temple. I packed my bag, sketchbook, water-bottle, donned a jacket and sneaked out from my uncle’s place in Rishikesh. I boarded the bus to Ukhimath from Haridwar. Next stop, Chopta! I reached Ukhimath in the afternoon. The sun-kissed hills surrounding Ukhimath were a treat for the eyes as subtle wave of tranquility pervades my soul. 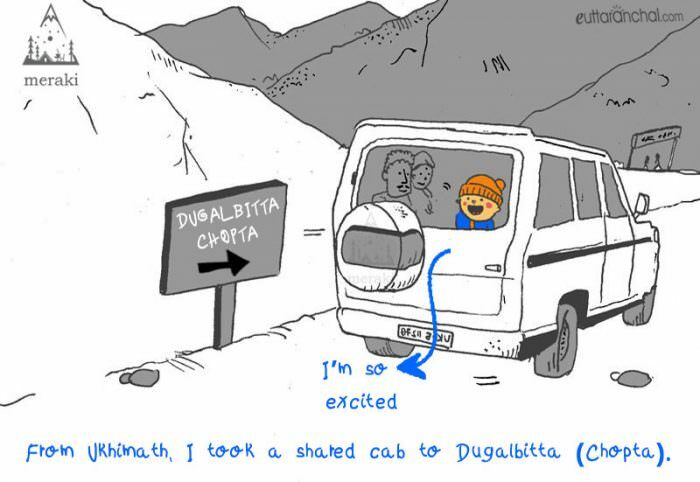 From there, I got into a shared cab to Dugalbitta, which is located 6 kms before Chopta. A peaceful location, Dugalbitta is ideal location for Tungnath-Chandrashila trek as well. Even during heavy snow in winter, Dugalbitta can be easily reached. Isn’t that great! I hopped on a shared cab from Ukhimath to Dugalbitta! I reached Dugalbitta in the evening. I was greeted by Bhupendra and Deepak sir (founders of eUttaranchal) who invited me to their Meraki Triangle homestay in Dugalbitta (Chopta). I already met Bhuppi sir at Sankri last month during my first ever trek to Kedarkantha. Since then, I just couldn’t resist the urge to travel. My grades are good, so my grandma is unable to find any excuse to stop me. I was greeted by Bhuppi and Deepak sir of eUttaranchal at Meraki Triangle homestay at Dugalbitta (Chopta). We sipped tea and munched on snacks, swooned over by immense natural beauty and serenity that enveloped this place. Himalayas is turning out to be so much more for me than just mere mountains – it inspires. I took my cuppa and sat on the slope from where I could see the entire Himalayan skyline. The crimson hue radiating off the Himalayan peaks is a sight to behold. I brought my sketchbook in hope of sketching some landscapes, but I just sat there – in complete stillness – bewitched. The Himalayan view from Dugalbitta is a treat to the eyes. After a scrumptious breakfast next morning, I packed a small bag and started my trek towards Tungnath. At 3,800 meters, it is world’s highest Shiva temple. 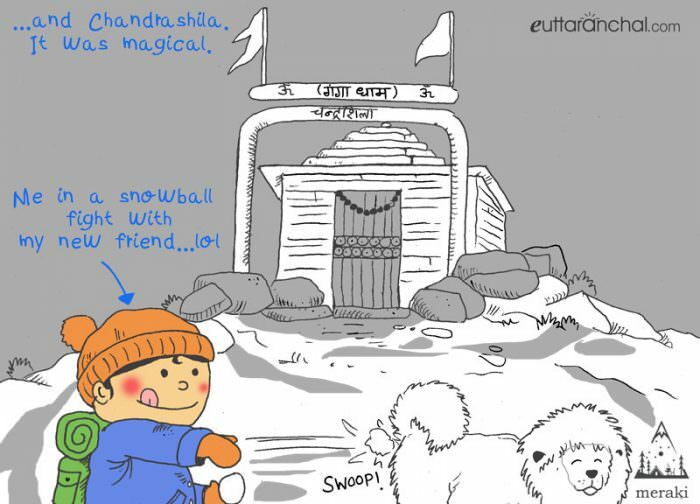 Tungnath is a revered shrine and one of the Panch Kedar temples in Uttarakhand. And guess what? I made a cute furry friend on the way. He followed me all the way to the shrine, where I bowed in reverence, before heading towards Chandrashila summit. Me and my furry friend at Tungnath. We reached Chandrashila summit which was covered in so much snow! I couldn’t believe my eyes. The 360-degree panorama from the summit of Chandrashila was spellbinding. Himalayan peaks such as Nanda Devi, Trishul, Bandarpoonch and Chaukhamba ornate the horizon while I played with my friend. Snowball fight! After an eventful day trekking in snow, I returned to Meraki Triangle as the sun set. It was getting cold during the nights, but a well lit bonfire made us forget about it. 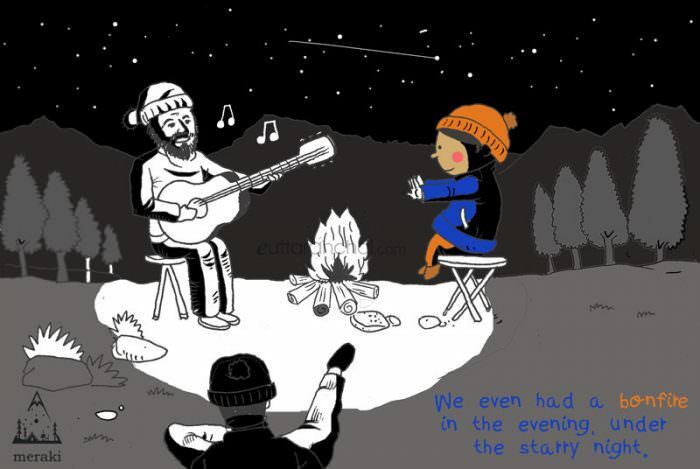 Honestly, a bonfire under the starry sky with some good company is all you really need. The crazy guy on the bus, remember? Well, turns out he was heading to Chopta as well. I met him again at bonfire, but this time around he was playing really good guitar. The guy started playing guitar as I tried to keep myself warm. I absolutely love bonfire! The next morning, I said goodbye to Bhuppi and Deepak sir. It was a memorable weekend spent amidst the Himalayas. Can’t wait to get here back in summer when it’ll be so much greener. Chopta, you’ll be missed dearly. Next morning, I bid adieu to the Meraki Triangle in Dugalbitta. It was a great weekend altogether. From where in Haridwar can i get the Ukhimath-Guptkashi bus and at what time? 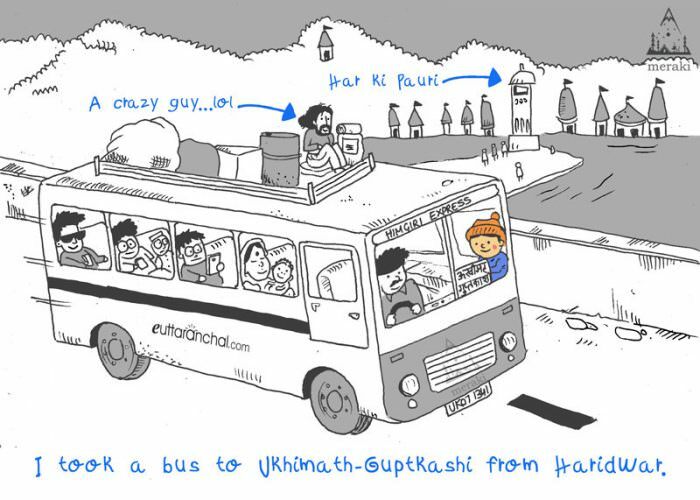 From where in Haridwar can I get the Ukhimath-Guptkashi bus ? And at what time? You cleared my all if and buts.. 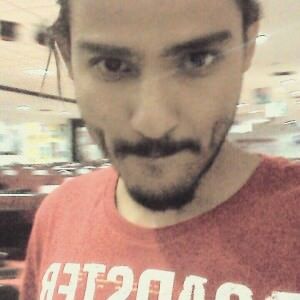 I am ready to leave but its my first solo trip so my mind was creating lot of confusions. Then I googled a solo trip experience to chopta..
It’s was your on google top search ..
It’s really amazing experience to read these travelling account of Nanda and salute the initiative of your team. This project would surely help to connect the uttarakhandi diaspora and to reach out to more people across the country, thereby giving boost to our tourism sector. 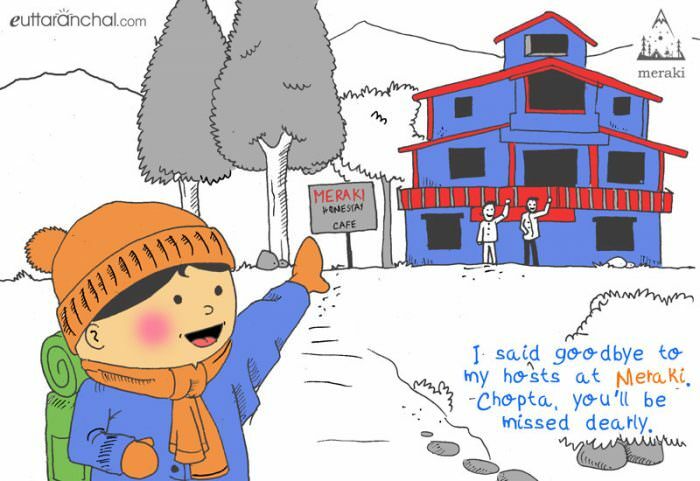 We recommended Mayadeep Resort at Dugalbitta, Chopta for your stay. 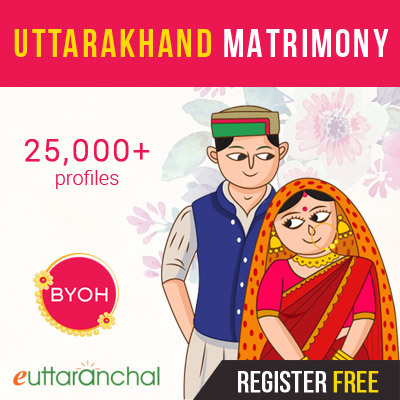 This property is owned by eUttaranchal! That’s some nice storytelling!!! Simple. Yet with charm! Keep it up!